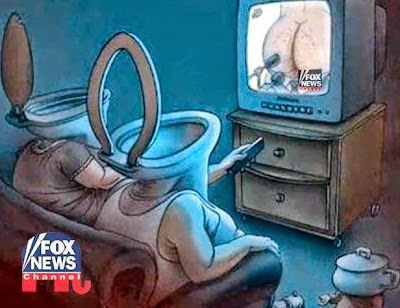 What better way to end the day than with a reminder of why we do not watch Fox News? Now hear this! Poll Numbers fit for a Carnival tent ticket. Watch Dobbs a day later..after you used that figurative carnival tent ticket. OOOOPS! The following is an excerpt The Mashable: 12 major Fox News quality reports from 2018. Or, should I type a lack of quality reports? In September, while appearing on Fox News, presidential son Eric Trump took a shot at legendary journalist Bob Woodward and his Trump-related book by saying it was just an effort "to make three extra shekels." No one in the Fox News studio batted an eyelash. ERIC TRUMP attacks Democrats: "Anti-law enforcement, high taxes, and elimination of plastic straws is not a message that will win in November." ERIC TRUMP then dismisses WOODWARD book as "sensational nonsense" he wrote "to make 3 extra shekels." The word for Israeli currency is also a favorite of 4chan and other racist boards. The Daily Stormer, a white supremacist neo-Nazi Holocaust denial site, frequently uses "shekel" to describe anti-Semitic conspiracy theories. Unless you're either literally in Israel or spending a lot of time in these alt-right spaces, it's pretty unlikely that you'll even use "shekel" in your daily vocabulary. If it was just a blind spot for everyone involved, then that is one hell of a shared blind spot. The comments are even worse given the that a month later, a gunman killed 11 people in a Pittsburgh synagogue while shouting anti-semitic slurs. 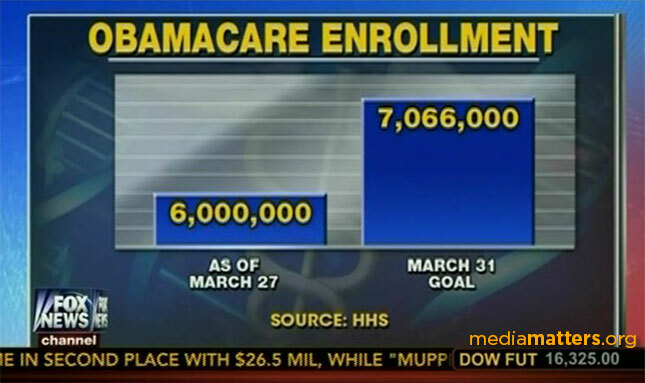 Oh, the Joy of Fox News. It is time for quick hit Trump smorgasbord. Actually, Carson was doing fairly well in the interview until the host cornered him to the point of his inane remark. Maybe Carson should tune-in and watch news other than Fox News. Or, just maybe he could consider reading a piece we posted a few days ago. Of curse, this piece wouldn't be worth the moments in reading if we didn't remind of the "deplorable" state of Trumpism. How about a MAGA hat clown intentional brandishing his Red Cap while visiting a vigil for the 50 people killed in New Zealand? Fifty killed and an equal number wounded via a self-confessed white supremacist trump supporter. On an international basis, we have witnessed unfettered and unrestrained white supremacist in our recent past. Must we repeat via demurring acquiescence? "I was given that information." Really? Is that how Trump has amassed over 9,000 verifiable lies (according to the Washington Post) since taking office in 2017? Do you believe the corrupt leadership and actions of the DOJ and FBI are now so outrageous and overwhelming that President Trump should fire Special Counsel Robert Mueller, Attorney General Jeff Sessions and Deputy Attorney General Rod Rosenstein? 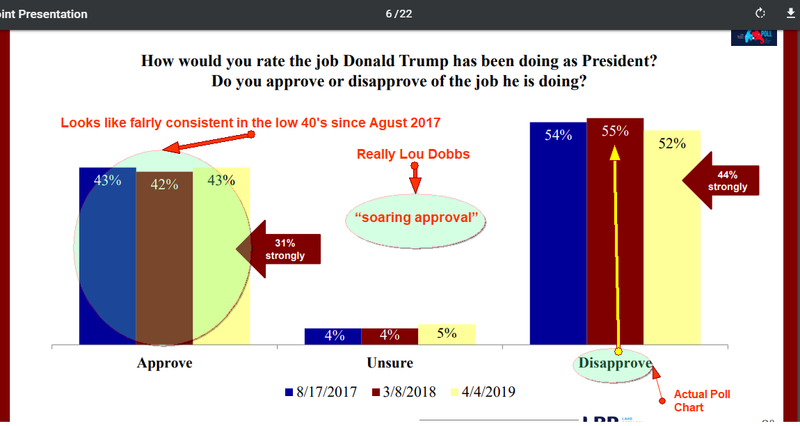 I know how I would answer that poll, but clearly Lou Dobbs thought his pudgy fingers would weigh down the scale just enough. Lou Dobbs, as usual, was wrong. No botty likes his poll. When the fairy granted Howdy Doody’s wish to become a real boy, no one could have predicted he would grow up to be such a hateful windbag. 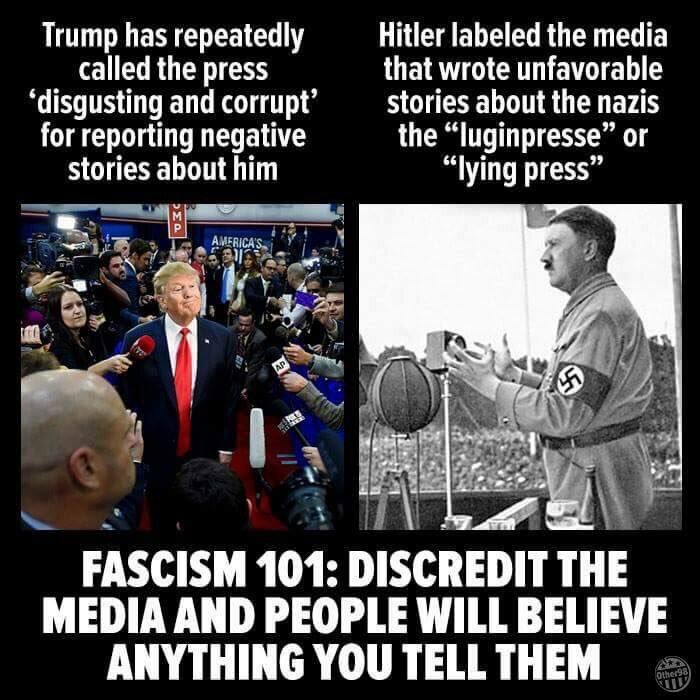 When leaders attack the press they do so out of motive, manipulation and their inner core of authoritarianism. Nixon’s senior staff followed their boss’s lead, adding 56 journalists and media executives to their infamous “enemies list.” There were attempts to intimidate through investigations and arrests; there were break-ins staged at private homes and offices. And in the case of the controversial investigative columnist Jack Anderson, Nixon’s operatives explored ways to murder the journalist via poison in his medicine cabinet or smearing LSD on the steering wheel of his car. We know what came of both Richard Nixon and his criminal VP henchman, Spiro Agnew. The press sunk then both with Agnew falling to fraud charges well prior to Nixon succumbing tot he Washington Post investigation of the Watergate break-in. US history is infested with comment from quotable sources regarding the press and national liberties. While Thomas Jefferson wrote about a free society's need for a free press, he later in life grew to distrust the press and wrote in accordance with his mistrust. John Adams apparently remain cautious of government intervention if the free press and wrote many passages as such. Here is one such piece of writing. Liberty cannot be preserved without a general knowledge among the people, who have a right, from the frame of their nature, to knowledge, as their great Creator, who does nothing in vain, has given them understandings, and a desire to know; but besides this, they have a right, an indisputable, unalienable, indefeasible, divine right to that most dreaded and envied kind of knowledge, I mean, of the characters and conduct of their rulers. Rulers are no more than attorneys, agents, and trustees, of the people; and if the cause, the interest, and trust, is insidiously betrayed, or wantonly trifled away, the people have a right to revoke the authority that they themselves have deputed, and to constitute other and better agents, attorneys and trustees. John Kenndy also wrote (and spoke) with regard to avoiding stifling a free press. Without debate, without criticism, no Administration and no country can succeed — and no republic can survive. ... And that is why our press was protected by the First Amendment — the only business in America specifically protected by the Constitution — not primarily to amuse and entertain, not to emphasize the trivial and the sentimental, not to simply "give the public what it wants" — but to inform, to arouse, to reflect, to state our dangers and our opportunities, to indicate our crises and our choices, to lead, mold, educate and sometimes even anger public opinion. This means greater coverage and analysis of international news — for it is no longer far away and foreign but close at hand and local. It means greater attention to improved understanding of the news as well as improved transmission. And it means, finally, that government at all levels, must meet its obligation to provide you with the fullest possible information outside the narrowest limits of national security. 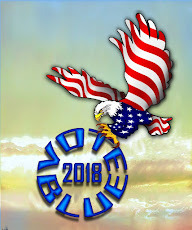 ... And so it is to the printing press — to the recorder of man's deeds, the keeper of his conscience, the courier of his news — that we look for strength and assistance, confident that with your help man will be what he was born to be: free and independent. Now for the diametrically opposite view (and policy), from another who placed a stamp on the history of humankind. Trump lashes out against news coverage he feels is non-supportive as surely as he awakens to tweet each morning. In a softball interview with Lou Dobbs, Fox Business, we see and hear a modern-day reincarnation of Hitler's views about the press. When Dobbs mentioned being treated fairly by media, his interview role was complete. 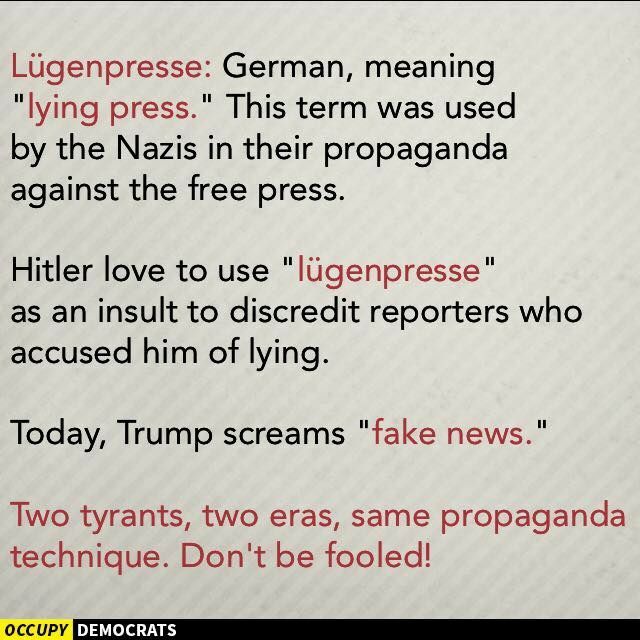 Total authoritarianism starts with stifling the free press (media), all that is bad from international leaders follow. FoxPEN (Fox Propaganda and Entertainment Network) employs an attorney/model named Meghan Kelly. If you doubt my assertion of model, simply Google the commentators name. (here, here and here) We think it safe to assume the images are not photoshopped. Before we move to today's take down, let's place Ms Kelly in true perspective as the ill advised cosigner for O'Reilly. Pepper-spraying a group of students in California drew a propaganda laced rationalization of pepper spray use on innocent and unarmed protesters. Ms. Kelly agreed that pepper spray is comparable to being sprayed with a vegetable! After that interview, Kelly's credibility is set at a very low level. Her comments were not much better than sleazy mercenaries who travel the globe for hire. Early in the week we published this piece. I am hearing a couple of FoxPEN women commentators are questioning the sanity and wisdom of the four men in the linked video. It wouldn't be a surprise of Ruppert Murdoch (or his wife) took exception to the loud and clear misogyny and ordered it addressed. Now, sit for the FoxPEN sanctioned lashing of two of the four misogynist. The FoxPEN women who have spoken out should have three words delivered to their dedication "bringing" right-wing propaganda for a fee: "Serves you right." I offer a bit more of an apropos image for the Fox News woman who have spoken out. "When you wallow with a pig, the pig loves it. First, you are in his pen in the muck and grime and he is happy. and now you STINK!" The deeper message should go to American women. You must know that "isms" travel in flocks. People who practice bigotry, racism and deep bias do not restrict their psychological deficiencies to one subject or group of people. Also remember you were granted the privilege to vote in the early 1900s. That was less than one half a century before black people who given the right to vote. There men have a position for you that they generally do not speak publicly. They want you in the house, in the bedroom, in the kitchen and with your mouth shielded in many ways. The men in the Lou Dobbs segment are no different than this man. Scott Terry of the White Student Union ends his racist railing during this years CPAC "oozing" with a direct confrontation to a woman seated behind him. The comment is a real anthem for the GOP and their consistent and ongoing "Shock and Awe" against women. It should be noted Mr. Juan Williams cares little about the level of muck in which he wallows for sake of his paycheck. The journalist who was once considered a credible speaker of opinion and reporting. His affiliation with FoxPEN gives the impression he has sold his credibility to the lowest level of 'yellow journalism" and "co-signership" of right wing "isms." Umbrella Gate! Seriously Conservative America, Seriously? After this introduction, we have posted a video is a exposition related to the scope and level of silliness conservative America is attempting to reap on President Obama. We have run the video before; a re-run in the context of the following piece is critical. As matter of re-introduction, President Obama ordered umbrella coverage from himself and Turkish Prime Minister Recep Erdogan during a Rose Garden public appearance and photo shoot. Thunk of the catastrophe of a pre-mature and unexpected re-casting of the event. Or, imagine allowing the Turkish leader to be come drenched from the rain. As you read through the piece, ask yourself, as if you don't already know the answer, "What is the problem?" Another question is, "Do these attackers not realize that all we do (today) have electronic trails?" Are they so shallow they completely disrespect the intellect of millions in the nation? Once we move from Fox News sycophants and severe Obama haters who relish and value the attacks, the silliness rivals that of childhood recess antics. Al Sharpton, MSNBC Politics Nation host, will introduce the segment and conduct a series of comments and opinions regarding the outright disrespect of the president via child-like behavior of people who are all multi-millionaire entertainers. I avoid characterization of Fox New host as journalist base do their network role of (pure) propagandist. Politics Nation (If you decide the full 9:29 minutes is not for you, at least check the opening 3:00 minutes and catch the segment close as Joe Madison follows comments from Chris Matthews earlier in the week). Tucker Carlson's The Daily Caller attempted to ridicule the president's order for umbrellas to shield himself and the Turkish Prime Minister from a brief shower. In The Caller's Guns and Gear section, the headline reads as follows. Now let's read a coupe of excerpts from the piece. According to Marine Corps regulation MCO P1020.34F of the Marine Corps Uniform Regulations chapter 3, a male Marine is not allowed to carry an umbrella while in uniform. There is no provision in the Marine Corps uniform regulation guidelines that allows a male Marine to carry an umbrella. Items not expressly delineated as authorized components of the Marine Corps uniform are prohibited. Male Marines are informed never to carry an umbrella from the earliest phases of training. Not even the President of the United States can request a Marine to carry an umbrella without the express consent of the Commandant of the Marine Corps, according to the Marine Corps Manual. Read more ( If you are curious and do not mind wasting time with silliness). Does The Caller writer actually want to go there? Did I read 'male' Marine? May I guess the regulations allow women Marines to carry umbrella's while not allowing a man to do same. May I also assume there is Prohibition against the "Male" marine carrying an umbrella? Better yet, does The Caller reach so deeply for the inane, they do not factor-in the type of service the White House has orders to performs. There are some who reach into the shallowness of a tadpole puddle to intimate the Rose Garden address should have been moved indoors. "Should have been moved indoors." 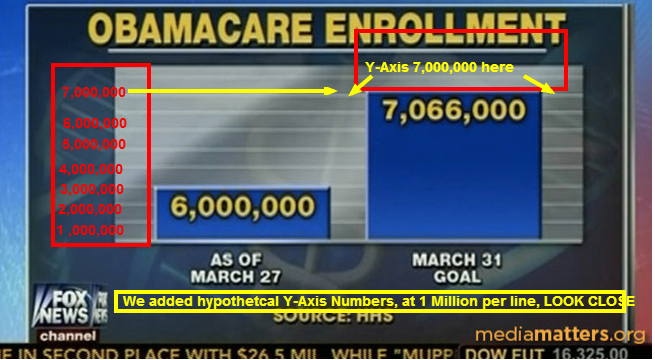 Does the multi-millionaire provocateur have any idea the planning that goes into such appearances in the Rose Garden. Better yet, the provocateur does not appear to understand the quick reaction to a brief squirt of raindrops that ended as quickly as it started. Yet, the provocateur posits and ridicules with, "Should have been moved indoors." I am being facetious of course the provocateur knows the tribulations an difficulty of quickly moving an international photo-op from its originally scheduled location. The provocateur is merely practicing Obama hatred and entertaining other haters. (Gotta earn that paycheck). Now for a couple of noted Obama "Haters." Lou Dobbs on Facebook referencing The Daily Caller piece. It is important to note the words used by Dobbs, "disrespectful inconsiderate, classless." Why should it be such for President Obama to seek the courtesy of an umbrella for a foreign leader? Obama has shown throughout the 2012 campaign he will speak publicly in the falling rain. Instead of jumping to Twitter for a quick tickle of his followers, the provocateur, Dobbs, did not even reflect on times when Obama spoke in the rain. In fact, the president clearly stated he had a change of clothing available, but the Turkish Prime Minister did not have a change. A more noteworthy "boo-boo", Obama seemed to forget the leaders name. Yet, that would not draw the low intellect tickle of the umbrella insults. While the following image does not included US military troops. It is clear holding an umbrella to shield leaders from the rain while performing official acts is factually humane and within protocol (at least for some people). Before we close this piece, allow a link form a conservative web page: Conservaitves4Pailn. Yeah. What an unbelievable crook? Palin's remarks were classically as expected ignorant and focused only at throwing mud. She consistently throws mud and obviously has few mirrors in her home, as she is not very resilient when mud hits her in the face (figuratively). She should certainly not throw mud if the mirror in the mirror reflects with umbrella over candidate. Thank the heavens she has no chance of ever spending serious time in Washington DC. It seems to me, the level of hatred of the president is so obvious among a segment of the population, the Right has allowed themselves to become overly ridiculous in their day to day attacks. 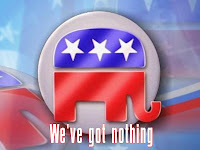 But, of course, when the nation is moving along towards an improved economy, we move from Bush wars, the Deficit is decreasing, medical costs increases are slowing, the party on the Right and their highly compensated demagogues must step-up to the level of muck.